How to prevent fleas in cats? To prevent fleas in our cats, it is advisable to use products that keep them free from the fleas that climb onto them, which are the adult fleas we can see, and also to control all other immature forms that may be in couches, beds and carpets, which we don’t see but which will cause our prevention to fail if we don’t keep them in check. Remember that for every flea we find today, there will be thousands in just a few weeks! This is why prevention is our best ally. How to eliminate fleas in cats? There are different products to eliminate fleas from our cats. For years, the most popular for their safety and easy application are pipettes, which are topical use products that are applied on the skin and are therefore safe because they only affect the fleas, not requiring our pet to metabolize any drugs, and killing the flea by simple contact. The most effective flea treatment is an integral one, which demands constant attention by the pet’s owner. By integral we mean a treatment that eliminates the fleas that are on the cat, while controlling the rest of the proliferation cycle in the environment. Expressed like that, this seems an impossible mission, but now there is Protech Gatos, a pipette that integrates both functions, which is why we call it the Smart Pipette. How can a pipette control the environmental load of fleas? When we apply a pipette like Protech Gatos, the active principle that takes care of the fleas in the home arrives via skin flaking and fur falling to the ground, on carpets and armchairs, preventing their continued growth. The advantage is that while our cat walks around the house or simply sleeps, it will be ensuring that the annoying parasites are not proliferating in the home. How often should Protech Gatos be applied? Protech Gatos pipette is applied once a month, and during this time the cat can bathe, get wet and also spend as much time outdoors as desired, because the formula is not deactivated under sunlight. It is advisable to allow 48 hours before or after bathing the cat to apply the pipette, because this will ensure proper skin coverage, allowing for even distribution all over the body. What diseases can fleas cause in cats? The disease most commonly associated with fleas in cats is Feline Infectious Anemia, whereby the flea transmits a bacterium from one cat to another that leads to the destruction of red blood cells, causing rather severe anemia. 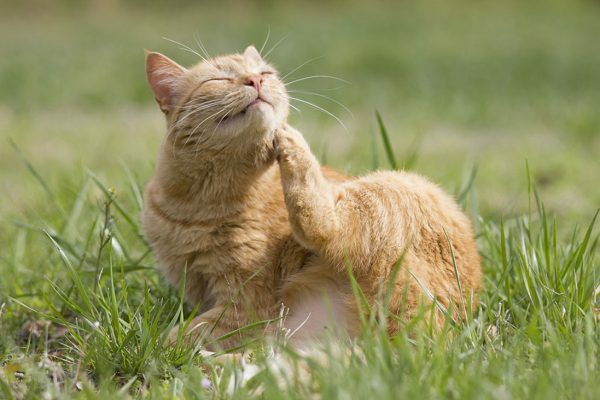 Other cats develop Flea Allergy Dermatitis (FAD), because they are allergic to the flea’s saliva and just one bite is enough to generate intense itching and skin lesions. Does a cat with fleas have any consequences for the health of people around it? A cat with fleas is not the only one who suffers consequences from bites; the people or other animals living with that pet suffer as well. In addition to annoying bites, fleas can transmit diseases caused by internal parasites such as Diphylidiasis, which causes intestinal discomfort mainly in children, or other bacterial diseases such as Bartonellosis or cat scratch disease, which can cause high fever and a variety of pains in people. Even without biting, fleas can cause problems because they and their excrement are environmental allergens, which increase symptoms in people who are more sensitive to household dust. How can we get rid of household fleas? In order to eradicate fleas, we must use consecutive treatments every month to eliminate adult fleas by applying a pipette, preferably those that offer environmental control and aren’t altered by sunlight or artificial light, which also offer residual power, as is the case of Protech Gatos. The longer we use them, the better the results and the healthier the environment. Which places in the home are most likely to be infested with fleas? The places in the home that fleas seek out are sheltered areas, and those that are warm, like carpets, mattresses, cushions, armchairs and even in the car, if our cat usually rides with us there. Also, remember that fleas are present all year round, in the hot months due to the warmer temperatures of the season, and in the cold months due to artificial heating and shelter in the home. How can we keep those indoor environments free from fleas? The ideal technique is to use pipettes on a monthly basis to fight adult fleas that are on the pet, which are also powerful enough to eliminate the “juvenile” forms found in the house, as is the case of Protech Gatos. There are other methods that can help as well, such as vacuuming surfaces, renovating or removing carpets or blankets we no longer use, etc. How can we avoid contagion between pets? To prevent the spread of fleas between cats and between cats and dogs, each one should be treated with the appropriate product for the species, meaning not using products for dogs on cats and vice-versa. It is important to keep in mind that dog fleas generally come from the cat, and this risk increases when both coexist in the same house. That is why it is vital to treat all pets that live together at the same time, every month. Fleas are insects with flat sides and a cover that allows them to glide swiftly through the animal’s fur, and which makes them resistant to crushing. Thanks to their hind limbs, they can jump large distances, up to 200 times the length of their own body! Each flea can lay between 40 and 50 eggs per day, and over 600 during its lifespan! It takes 3-4 weeks from the moment when an adult flea lays an egg until a new flea is born, which means that we can quickly go from one flea to thousands! That is why prevention is so important. Adult fleas live their entire lives on the animal, but eggs, larvae and pupae live in the environment and represent the “real” problem to eradicate. Adult fleas feed on blood, and their saliva contains an anticoagulant that allows them to feed all the time. Flea larvae feed on adult flea droppings and other organic remains found in soil, beds and couches. The pupae do not feed, but remain inside a very resistant cocoon and wait for the best conditions to emerge and begin biting. It may take months before signs such as temperature, humidity, vibration or the gases that we eliminate with breath “awaken” them. When a pupa comes out of its cocoon, all it wants is to “eat”, and it will bite whatever it finds in its path, which is why people can also suffer from these annoying invaders. Flea saliva has allergens that generate a lot of itching; some pets are very sensitive and can develop severe dermatitis. In addition, all of the associated stress can affect their general defenses. Fleas can transmit diseases between animals, and between animals and humans. The key to success in eradicating them is to treat both the pets and the environment where they live, and above all, for the treatment to be continuous.